Genes Nutr. 2007 November; 2(2): 169–180. Distribution of VGF peptides in the human cortex and their selective changes in Parkinson's and Alzheimer's diseases. VGF mRNA and its precursor-derived products are selectively expressed in certain neurons and promptly respond to neurotrophins and to neural/electrical activity. Proteomic studies have previously revealed a reduction in some VGF peptides in the cerebrospinal fluid of patients affected by Alzheimer's disease and other conditions, suggesting their potential diagnostic and clinical significance. As the presence of VGF peptides within the human cortex has been somewhat elucidated, they were studied postmortem in the frontal, parietal, and temporal cortex areas of control subjects and patients affected by Parkinson's disease, and in parietal cortex samples from patients with Alzheimer's disease. We raised antibodies to the C-/N-terminal portions of the proVGF precursor protein, to the TPGH and TLQP sequences and to the neuroendocrine regulatory peptide (NERP)-1, all used for enzyme-linked immunosorbent assay coupled with gel chromatography and for immunohistochemistry. In the control brain samples, the levels of TPGH and C-terminus peptides were about 130-200 and 700-2000 pmol g⁻¹, respectively, the N-terminus and NERP-1 peptides were less represented (about 10-30 and 4-20 pmol g⁻¹, respectively), and the TLQP peptides were below detection limits. Upon gel chromatography, the VGF antisera mainly revealed small molecular weight forms (i.e. about 0.8-1.3 kDa), whereas VGF immunolocalisation was found within different types of neuron in rat and bovine brain cortices. In the Parkinson's disease samples, a clear-cut decrease was revealed in the parietal cortex only, exclusively for TPGH and NERP-1 peptides, whereas in the Alzheimer's disease samples, a reduction in all of the VGF peptides was shown. The results suggest the involvement of VGF in the physiological or pathophysiological mechanisms occurring in the parietal cortex of patients with Parkinson's and Alzheimer's diseases. Cocco C et al., J Anat. 2010 Dec;217(6):683-93. doi: 10.1111/j.1469-7580.2010.01309.x. Epub 2010 Oct 12. Neurons and endocrine cells have the regulated secretory pathway (RSP), in which precursor proteins undergo proteolytic processing by prohormone convertase (PC) 1/3 or 2 to generate bioactive peptides. While motifs for PC-mediated processing have been described (R/K-Xn-R/K, n=0, 2, 4, 6), actual processing sites cannot be predicted from amino acid sequences alone. We hypothesized that discovery of bioactive peptides would be facilitated by experimentally identifying signal sequence cleavage sites and processing sites. However, in vivo and in vitro peptide degradation, which is widely recognized in peptidomics, often hampers processing site determination. To obtain sequence information about peptides generated in the RSP on a large scale, we applied a brief exocytotic stimulus (2 min) to cultured endocrine cells and analyzed peptides released into supernatant using LC-MSMS. 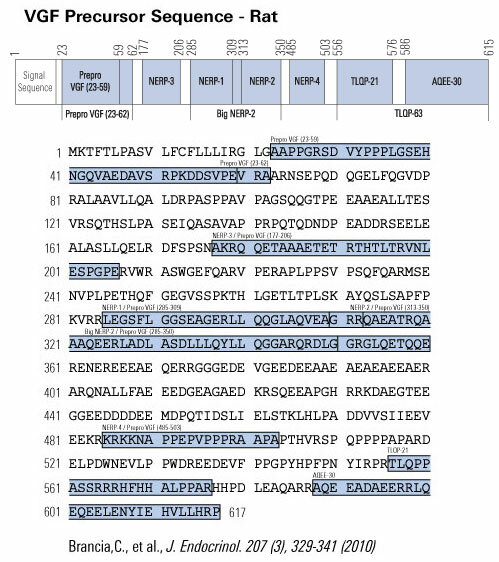 Of note, 387 of the 400 identified peptides arose from 19 precursor proteins known to be processed in the RSP, including nine peptide hormone and neuropeptide precursors, seven granin-like proteins, and three processing enzymes (PC1/3, PC2, and peptidyl-glycine alpha-amidating monooxygenase). 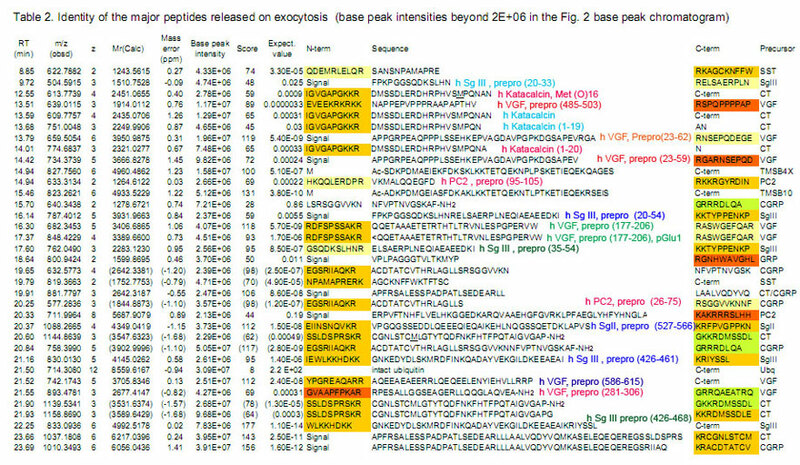 In total, 373 peptides were informative enough to predict processing sites in that they have signal sequence cleavage sites, PC consensus sites or monobasic cleavage sites. 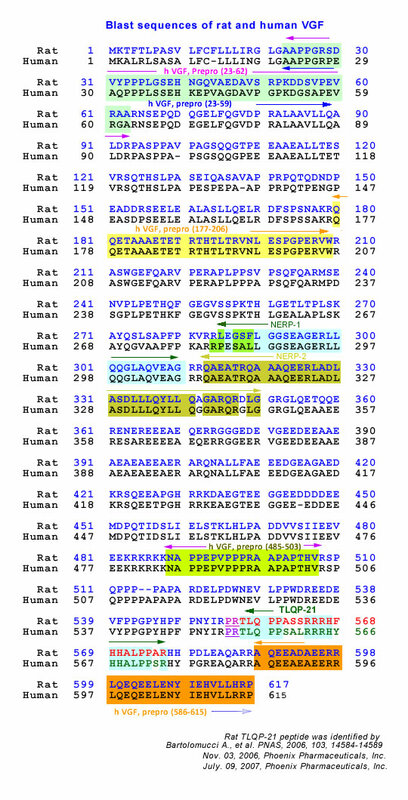 Several monobasic cleavage sites identified here were previously proved to be generated by PCs. Thus, our approach helps to predict processing sites of RSP precursor proteins and will expedite the identification of unknown bioactive peptides hidden in precursor sequences. 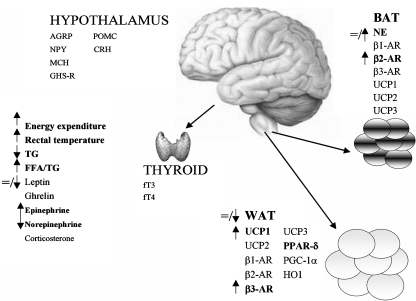 Energy homeostasis is a complex physiological function coordinated at multiple levels. The issue of genetic regulation of nutrition and metabolism is attracting increasing interest and new energy homeostasis-regulatory genes are continuously identified. Among these genes, vgf is gaining increasing interest following two observations: (1) VGF-/- mice have a lean and hypermetabolic phenotype; (2) the first VGF-derived peptide involved in energy homeostasis, named TLQP-21, has been identified. The aim of this review will be to discuss the role of the vgf gene and VGF derived peptides in metabolic and nutritional functions. In particular we will: (1) provide a brief overview on the central systems regulating energy homeostasis and nutrition particularly focusing on the melanocortin system; (2) introduce the structure and molecular characteristic of vgf; (3) describe the phenotype of VGF deficient mice; (4) present recent data on the metabolic role of VGF-derived peptides, particularly focusing on one peptide named TLQP-21. Bartolomucci A., et al. Genes Nutr. 2007 November; 2(2): 169–180. 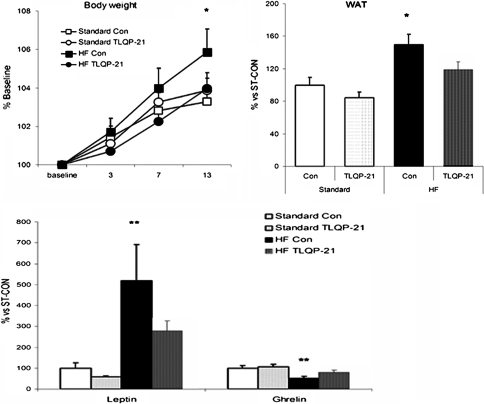 Physiological effects of chronic central TLQP-21 in mice fed high-fat diet. Upper left changes in body weight; Upper right changes in white adipose tissue weight; Lower changes in circulating leptin and ghrelin. Published online 2007 October 18. doi: 10.1007/s12263-007-0047-0.